03 November 2017 Ennis, TX- The South Bend Clutch Pro Stock class is one of the more competitive classes on the NHRDA Diesel Sled Pulling Series. This past season saw six different pullers in the Winner's Circle over the course of nine events. At the end of the long season, Tom Hansen of Grantsville Utah was the puller that was sitting at the top of the NHRDA National Championship standings. Hansen and his truck The Hybrid traveled all over the country chasing the NHRDA National Points this past season. Tom started the 2017 NHRDA season at the Desert Diesel Nationals presented by Strictly Diesel. Hansen was very happy to get out of the cold of Utah and into the sunny skies of the Arizona desert. Tom's truck, The Hybrid, which is sponsored by Edge Products and Industrial Injection, has always been one of the top trucks in the South Bend Clutch Pro Stock class and Tom was hoping for the same in 2017. Hansen's first pull of the season was aborted around 20 feet, he was allowed to back up and make a second attempt, the second attempt was much better. Tom was able to navigate the sled pull track and went a distance of 289.21 feet. Hansen did pop something at the end of the track as he had a very small fire under the hood. The NHRDA crew was able to put it out with very little trouble and there was little to no damage done to the truck. Hansen and The Hybrid left the Desert Diesel Nationals with a second place finish. 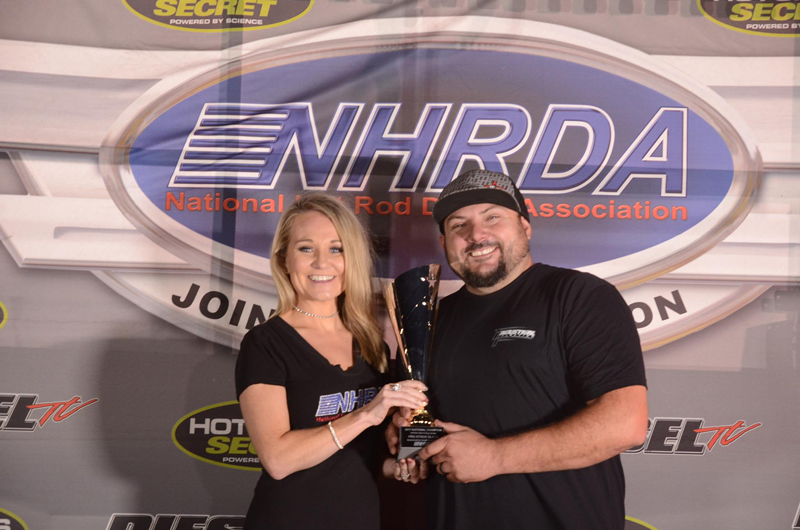 The next event was the Nor Cal Diesel Nationals and Hansen made the trip over to Sacramento California to earn those valuable National Championship points. But Mother Nature had something to say to that, as rain and storms made the sled pulls impossible to complete. Hansen did get the 10 points for the rainout and moved into the #1 spot in the South Bend Clutch Pro Stock standings. 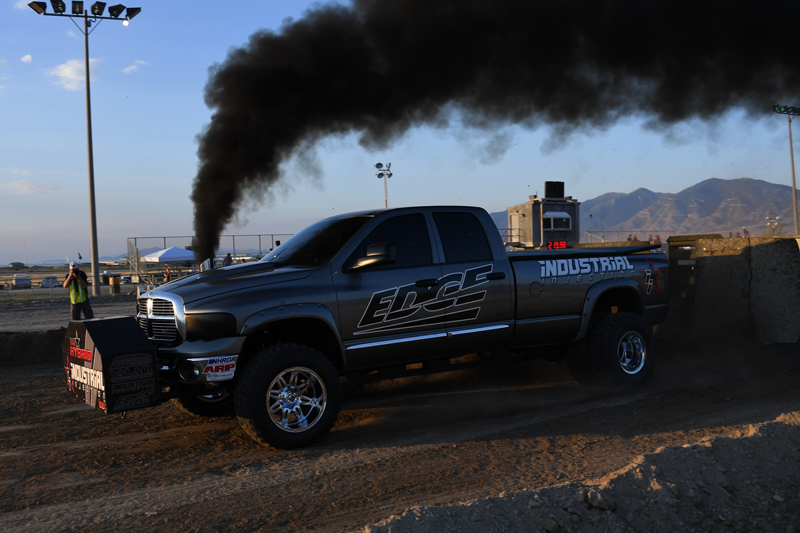 Hansen's next event was the Diesels on the Mountain at Bandimere Speedway. The event in Denver is one of Hansen's favorite as he has won the South Bend Clutch Pro Stock lass the past three seasons (2014, 2015 and 2016). Hansen had some trouble on his first attempt and decided to go with his first pull re-hook option. The sled backed him up and he was ready for the second attempt. This attempt went much better The Hybrid made its way down the track at Bandimere Speedway and stopped at a distance of 320.88 feet. The distance was good enough for the win and Hansen's fourth consecutive victory in Denver. 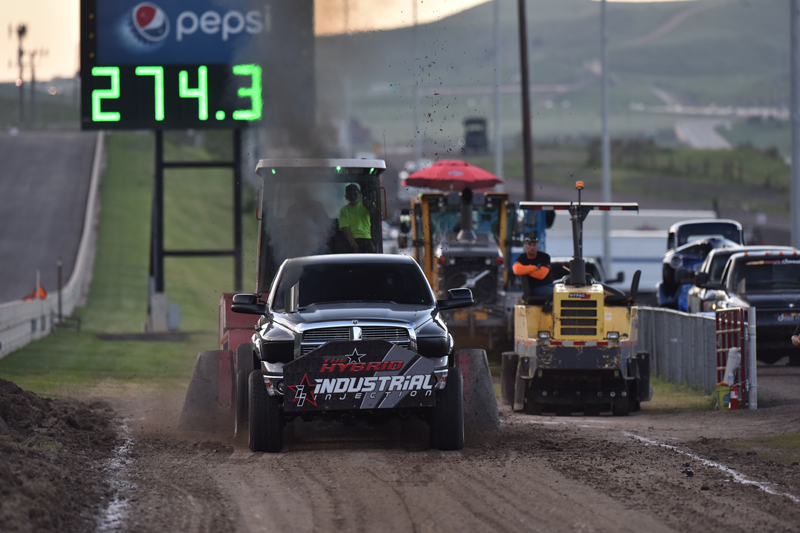 In the Winner's Circle Tom Hansen talked about how happy he was about the brand new sled pull track at Bandimere Speedway, "I was worried a little about how narrow it was but it is a good track and I'm very happy to get my fourth win in a row." "I can't wait for the next event in Salt Lake City, the sled pull track is less than 5 minutes from my house. 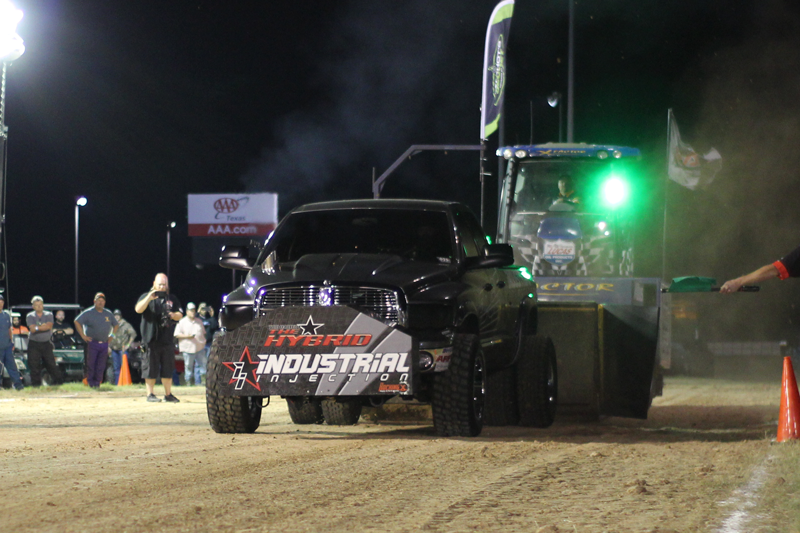 We travel all over the country for these events and it will be nice to get one so close to home," Hansen added about the Rocky Mountain Diesel Nationals presented by Industrial Injection. Heading into the Rocky Mountain Diesel Nationals presented by Industrial Injection, Hansen was only two points back of the National Championship points leader, Amalee Mueller, in the South Bend Clutch Pro Stock standings. Hansen and his Industrial Injection and Edge sponsored trucked rolled up to the starting line looking to impress the home town crowd. The truck left the line smoothly and was pulling hard mid track but at around 300 feet the engine kind of nosed over and the truck started slowing. Hansen came to a stop at 333.48 feet. Hansen would end up fourth place on the night but he would leave the Rocky Mountain Diesel Nationals presented by Industrial Injection with the National Championship points lead. 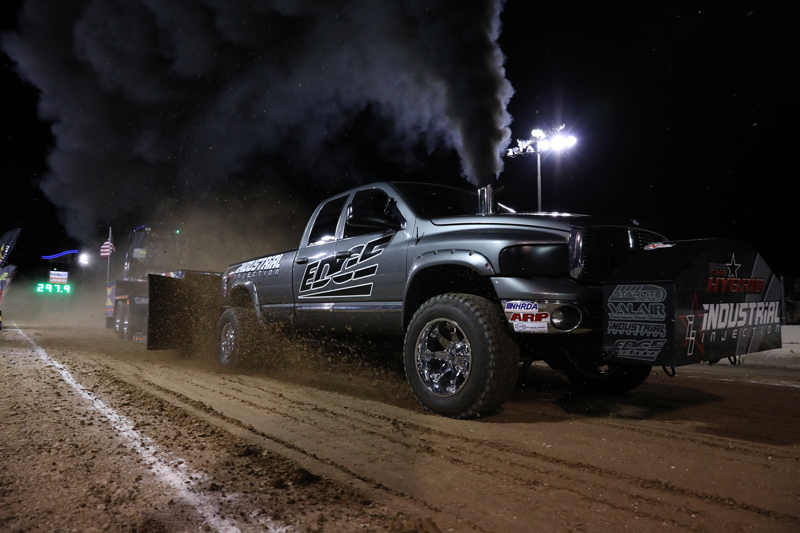 At the next stop on the NHRDA Diesel Sled Pulling Series, the Big Sky Truck Fest presented by G & J Diesel, Hansen had some mechanical troubles. He was only able to record a distance of 108.07 feet. Tom did finish in second place for the event and extended his lead in the National Championship points standings. Hansen clinched the National Championship once he passed tech inspection at the NHRDA World Finals. After rolling over the scales he then focused only on winning the World Championship and taking home the NHRDA World Champion ring. Hansen again had some trouble on his first attempt and since he had the first puller re-hook option he took it. Tom and the Industrial Injection crew got his truck backed up and they started working on trying to figure out what was going on. In the meantime Hansen watched the defending South Bend Clutch Pro Stock World Champion, Jim Greenway, pull a distance of 370.09 feet. Hansen knew it would take everything The Hybrid had to come away with a NHRDA World Championship. Unfortunately Hansen and his crew didn't find the gremlin that plagued them on their first attempt and he was only able to go 53.03 feet. Tom and the crew were more confused than upset as they still had no idea what the issue on The Hybrid was but since the pulling season was over they would have all winter to work on finding the problem. When asked about the long season and all the great events Tom said, "Yes we put in a lot of miles this year but at the end it is a great feeling to have that National Championship." "I would also like to thank everyone at Industrial Injection for everything they have done for me, Starlite Diesel for a great tune, Edge Products who have been with me since the beginning. I also want to thank Valair Clutch for a great setup. And of course my loving family for letting me go on the road and do what I love." Tom will now look to the 2018 season and defending his National Championship and going after the NHRDA World Championship as well.